My first leg of grad school is over! More importantly, final papers have been turned in, and a degree is in my hand! Fun Fact #1: One of my term papers was about reading American superhero comics as myth defined by Claude Levi-Strauss. Fun Fact #2: That’s our subject today. Levi-Strauss’ Figure 1 is an illustration of what it would be like to read multiple variants of the same myth in a logical way to determine a “structural law of myth.” These images would all function like projector transparencies which, when stacked together, create a conglomerate image which represent the structure created by the combined traits of all the images within the stack. Each individual version contains its own similarities and differences. “The Structural Study of Myth” argues that the real study of myth should focus on the structural law of myth instead of on individual stories which fail to interpret the full breadth of myth. While I agree that approaching myth by studying only individual stories is not a comprehensive way of studying myth, I do believe that it remains an important part of studying myth. The second image is a page from issue 11 of Young Avengers by Kieron Gillen, Jamie McKelvie, and Matt Wilson. Young Avengers #11, Kieron Gillen, Jamie McKelvie, and Matt Wilson. Marvel. 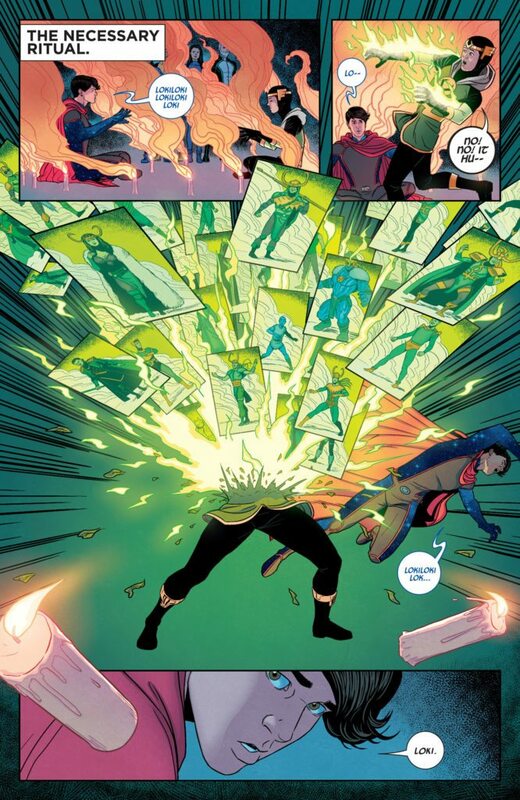 Let’s take a look at this image from Young Avengers. At this moment, Wiccan has cast a spell to transform Loki into a being that can hold a larger amount of power. As Kid Loki transforms, images of his past forms, from the past, from alternate universes, and from film, explode out of him. While these images aren’t meant to overlap completely like Levi-Strauss’ layers, some do cover bits of others, and no single image completely blocks out another. Details shine through. The presentation of a number of images allows the reader to recognize repeating traits, such as color themes and headgear, while allowing differences between images to be examined as well. Most readers of mainstream American superhero comics are familiar with the constant hunt (by both readers and creators) of a single “canon” storyline. However, we also know that the sheer amount of content created makes it impossible to do so (even as publishing companies “retcon” past stories to make them fit in the large framework better). Though a publishing company may abandon a storyline by, say, the clever use of time travel, that use of time travel can’t wipe that story from the memories of the readers. Contradictions exist, persist. They can’t be written away, and they shouldn’t be. Different creators bring different perspectives to familiar characters and storylines. Innovation keeps comics alive. We often see the more radical changes placed in coexisting alternate universes or even in the old Marvel “What If?” stories. While some of the wilder stories may seem a bit hokey, by ignoring all of these details in search of one overarching formal structure of myth, a scholar could easily miss the rich complexity that comes with an expanse of content. For example, the present Loki in Marvel comics is an amazing amalgamation of Loki in myth, Loki in popular culture and knowledge, Loki in Marvel history, and Loki through the fresh eyes of the creator. An image like the one above allows creators like Jamie McKelvie, Kieron Gillen, and Matt Wilson to not only portray the similarities of the past Lokis but also highlight the differences and contradictions that might appear in each depiction. Various Marvel Lokis in multiple media. Contradictions provide information about the creators, about trends, and about the time when each story is told. Loki has gone through several transformations since his first appearance in Marvel Comics (which was also a transformation from myth to supervillain character). Loki’s design as menacing and conniving villain in 1962 (when he first appeared as Thor’s adversary) may not seem as menacing in 2011 when costume designers were thinking about Loki’s first appearance on the silver screen in Thor. Loki’s costume design in Thor became so iconic that for many fans, that design represents Loki. However iconic that design may be, Loki’s film costume is not the costume that the current iteration of Loki wears.Still, the more powerful an iteration of the character if to the readers or viewers, the more lasting of an effect it has on the progressing history of the character. For historical or sociological-minded scholars, these iconic versions can help map what audiences respond to during different times in history. When studying comics, it is important to consider Levi-Strauss’ focus on the structure of the myth, but it is important to look past it as well. Because comics, unlike myth, are meant to be published either physically or digitally, scholars can access virtually every version of the story. The variations found in these stories may be just as important as the similarities that create the structures of the story. By studying both the structure of myth and the variations of myth allows the conscious reader to approach a large body of seemingly contradictory storytelling with a map (the structural law) and remaining ground to explore (the individual stories). Lévi -Strauss, Claude. “The Structural Study of Myth.” The Journal of American Folklore 68.270 (1955): 428. Web. Gillen, Kieron (w), McKelvie, Jamie (a), Young Avengers (Jan. 2013-Jan. 2014). Marvel Comics.